Lions Mane (W7W/KG-125) is an intriguing 2 point bump that sits between a gravel county road and the North fork of the Snoqualmie River. 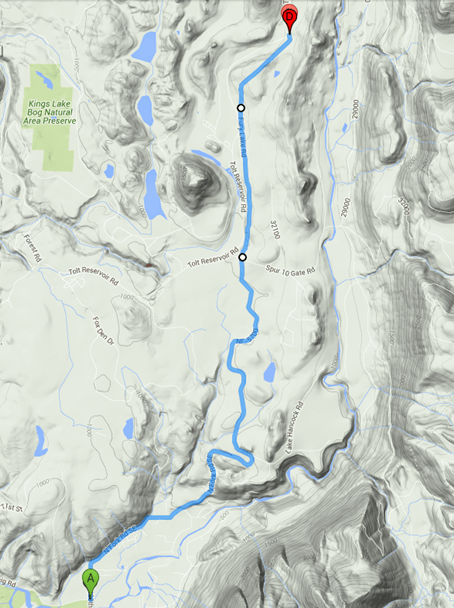 The trip is about 3 miles round trip with about 750′ of elevation gain. 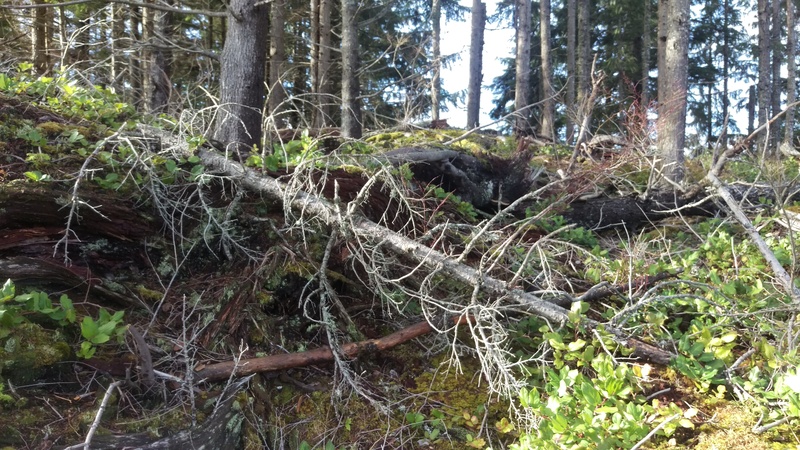 Most of the hike is along an old overgrown logging road that presents few challenges. The last 200′ of elevation gain is an 1/8 mile cross-country scramble through new growth and slash. There are some nice views and good coverage on VHF into the Puget Sound region. 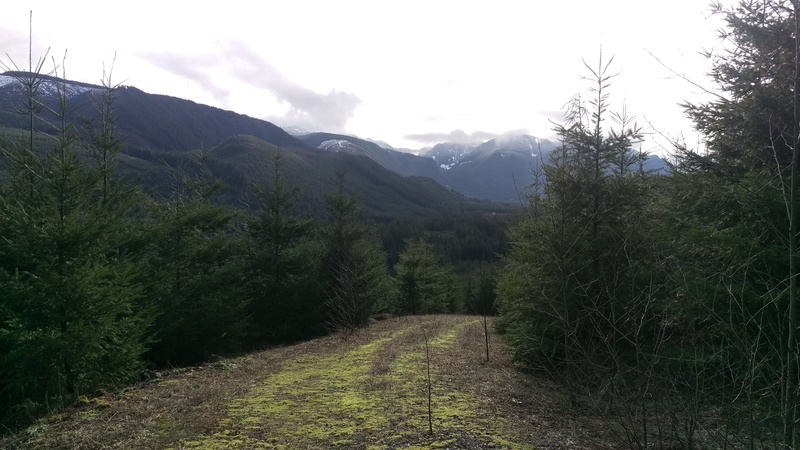 You must purchase a permit (daily or annual) to hike on the private logging lands that include Lions Mane. First Attempt: This was my second attempt at this previously unactivated summit. On News Year Eve day, I attempted an approach from the North, based on an older report of a hike taken shortly after much of Lions Mane was logged. 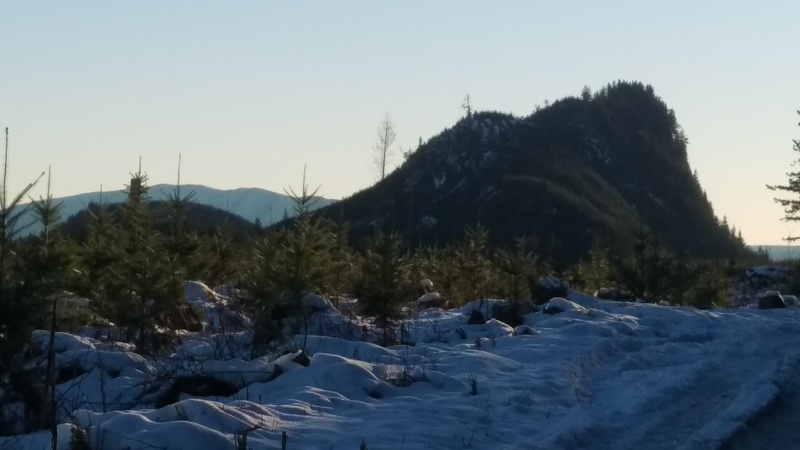 When I arrived on December 31st, the old logging road was fine, but the final ascent along the ridge was all but impassible. Young evergreen trees, from 3′ to 10′ tall produced a thick mesh that made progress slow (particularly with antenna parts sticking up above my head). Additionally, the ground was covered with logging slash that made the walking treacherous enough. And then there was the foot of snow that covered the slash. I tried followed game tracks in the snow, but abandoned the attempt after missing my activation time and realizing how difficult the return trip would be in the dark (on New Year Day in UTC). Here is what the north face of Lions Mane looks like, taken from the road after the aborted summit attempt. I returned on 24 January 2016 with a new route, and had a much better experience. What does an annual permit buy you? Besides Lions Mane, there are an additional 7 or 8 SOTA summits in the Handcock lands including Fuller Mountain (W7W/KG-124), Black Devil (W7W/KG-123), Deep Devil (W7W/KG-119), Lynch the Devil (W7W/KG-120), (I sense a theme…) Tokul Hills North (W7W/KG-128), “Extra Class Mountain” (W7W/KG-129), “Hellschreiber Peak” (W7W/KG-130), and maybe “Duplex Peak” (W7W/KG-104). Given the low altitude and proximity to the Seattle metropolitan area, these are excellent summits for the winter. I’ve activated Fuller Mountain and Black Devil and will submit reports later. There is one caveat about buying a permit. The property is closed to permit holders if the owners judge the fire danger too high. We had a dry year in 2015, so the Handcock lands were closed for much of the summer. Check the web site before heading out there. Trail Head: The trail head is a little tricky to find, particularly if you rely on a road GPS or Google maps for navigation. That’s because they will try to send you along private roads that Handcock uses for their logging trucks. These roads are not gated in some places, but they are well marked as private and as requiring a motor vehicle permit for entry. I program my GPS to first go to the intersection of SE Reinig Rd and 428th Ave SE (47.5234898, -121.7696714) in Snoqualmie. From that intersection, I program in the coordinates for the trail head at 47.6080221, -121.7254257. Follow 428th Ave to the north. In about 1.5 mile, just after passing 440th Ave SE, the road forks. You will be tempted to continue “straight” on the right fork, but either the “Dead End” sign for the right branch or the arrow painted on the road pointing to the left should prompt you to continue on the left fork that climbs sharply uphill. 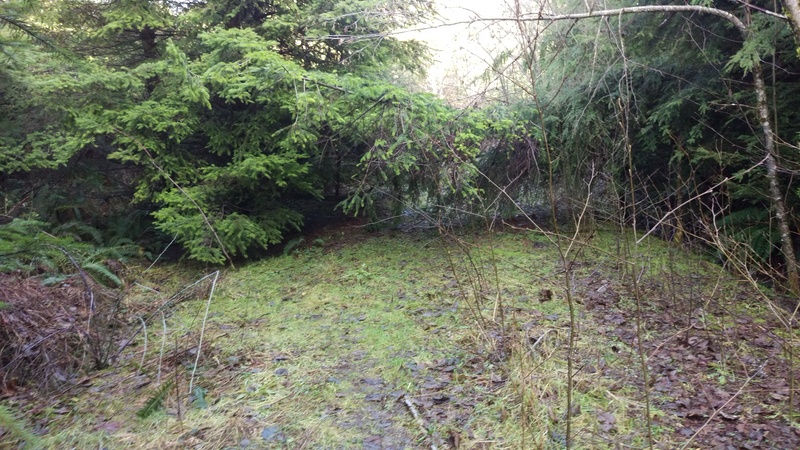 The correct path from SE Reinig Rd and 428th Ave SE (point A) to the trailhead (point D). The white markers show spots where your GPS may tell you to turn. Ignore it and just continue on the main road. The road turns to gravel and has plenty of potholes, but a high clearance vehicle is not really needed unless there is snow. 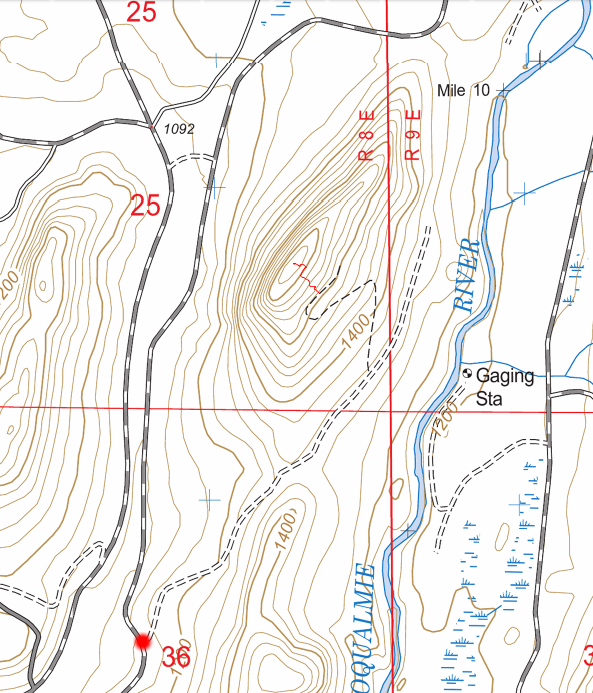 Summit Route: The trial head begins at an unused gated road on the right (red mark on map). There are places to park off the side of the road before and after the gate (don’t block the gate or the roads, of course). Follow the road, which will sometimes require light bushwhacking of young trees. Walking poles are more helpful for diverting the young branches than for walking. There were a few spots where the road was blocked by a fallen tree, but the obstructions were not difficult to get around. After about 3/4 of a mile, you will reach a major fork in the road. 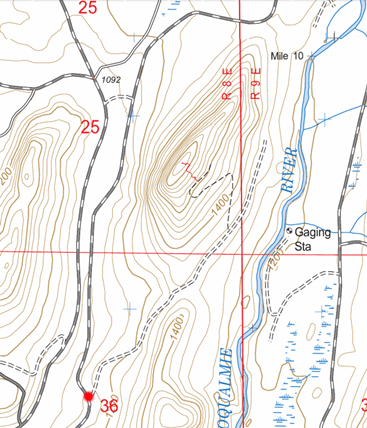 Follow the left fork (shown as a 4WD track on USGS topo maps) uphill. 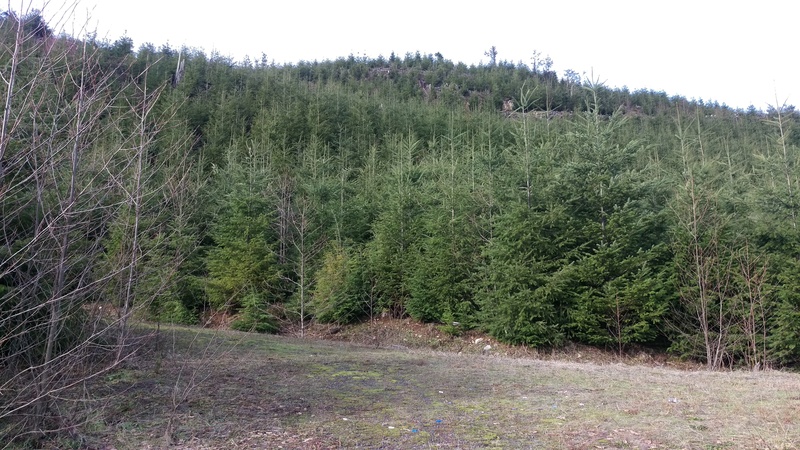 After the second switchback, you can see the tallest trees on the summit. Here you have a choice of continuing on the road to hike the N spine or undertaking a short bushwhack straight to the summit. I opted for the shorter route as depicted by the red line on the map. The final ascent was not particularly difficult, but the logging slash requires some care. Here is the view from the first switch back. The section from the second switch back to the summit can just be made out. A view to the east from the 4WD trail. The summit itself is delightful. The floor is pretty clean. There are good views of the Cascade mountains to the east. Past logging operations left plenty of tall trees that make good wire antenna supports. Activation: This was a fun activation. First, because the sun was out for much of my adventure. But secondly, UPS delivered a new Elecraft KX3 kit (plus 2m internal transverter) the previous Friday. I spent that evening assembling and testing it in preparation for this activation. 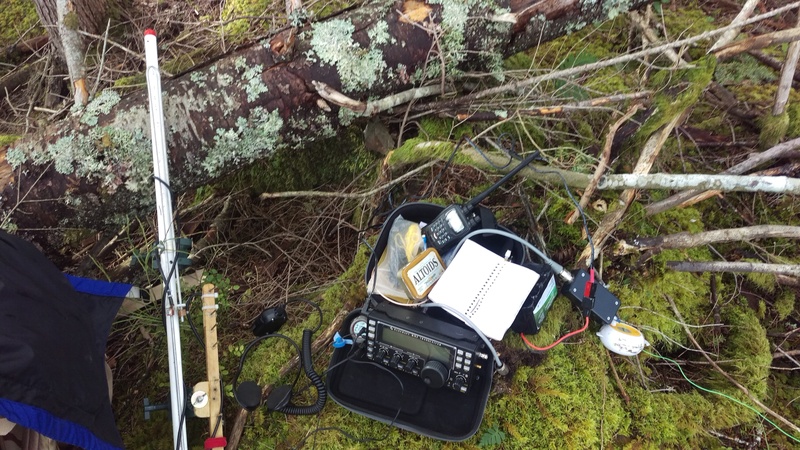 I felt light-footed on the trail after swapping a Yaesu FT-857 with the lightweight KX3 in my pack. 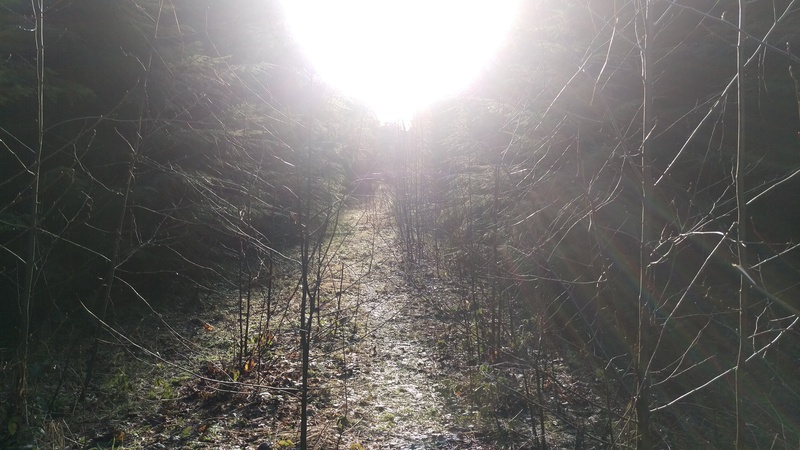 From my January experience, I built in plenty of time for bushwhacking. It wasn’t necessary, I was on the summit an hour and fifteen minutes before my activation time. I strung up a long wire antenna and got the 2m and 1296 MHz yagis set up. A spot went out via SOTA Spotter for 20m, but I had neglected to notice that the words “Test Only” remained in the comment field (D’oh!). All subsequent attempts to send spots failed. Fortunately, WA2USA heard my call on 20m CW, and I was able to raise WA2FBN on 17m CW before turning my attention to VHF. My buddy Ray, W7GLF, heard my call on 146.52 MHz, and we QSYed to 903.2 MHz and then 1296.2 MHz. A call on 144.2 MHz found my buddies Bob, N7QOZ, and Mike, KD7TS. Finally, Steve, K7PZN, who I believe was mobile, worked me for the first time. The return trip was fast and quite pleasant.